Today, I will be focusing on becoming spiritually prepared. In the "Pursuit of Excellence" booklet the goal I have chosen is : "Faithfully fulfill responsibilities in elders quorum or Relief Society." For this I am going to be focusing on Visit Teaching. This month's Visit Teaching message can be found here. 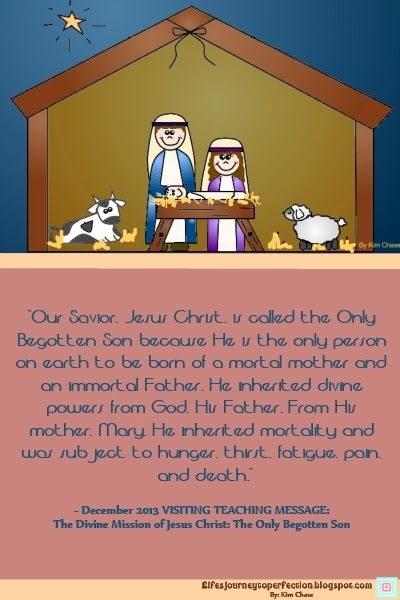 This month's message is, "The Divine Mission of Jesus Christ: The Only Begotten Son". I usually always print out or e-mail the message for the sisters I visit. I like to highlight the parts I am touched by and then write my thoughts and testimony on the subject. I really do enjoy visiting with the sisters I visit, but sometimes schedules get busy and a scheduled sit down appointment might not happen. In these cases, I make sure I either drop something off, or send a quick e-mail with the message. I sincerely care about the sisters I visit and consider them my friends. I love this month's message, especially this time of year. Our Savior's birth is important because of his Divine mission. He was the perfect example to us throughout his life. When the time came he willingly suffered for all of our sorrows, pains and sins. Because of this he knows exactly what we go through, thus we are never alone. Then he gave his life for each of us and because he is the Only Begotten he was able to overcome physical death and be resurrected, making it possible for each of us to one day be resurrected also.